We are sooo excited we cannot hold it in. Another giveaway starts tonight at midnight and we have decided to giveaway the same thing in this giveaway. Well, not exactly the same it will have a few different items. In case you missed it, it is most of the stuff you need for a great Halloween celebration. Let's start with a YANKEE CANDLE....a black tablecloth, black paper plates, black napkins, black cups. I will also put in some decorations for the table and candy. We will also add a few surprises...Picture will be posted as soon as possible. This is also a great group of bloggers doing this hop. I am sure they are all going to have some great prizes. Please check them all out, even Mommy's younger sister http://dealsharingaunt.blogspot.com . Please enter below. Let's have some fun! HERE COMES THE SPOOKTACULAR GIVEAWAY HOP! Tonight at midnight starts the SPOOKTACULAR GIVEAWAY HOP! I sat down and tried to think of Halloween and how I love to celebrate it. So here goes, a candle to make it scary, small candles on a table and a bowl filled with candy. I couple of masks around the table. A black tablecloth, black napkins and black cups, and some silverware, and of course a few surprises. I will tell you that the candle will be my favorite a YANKEE CANDLE, is there any other kind. 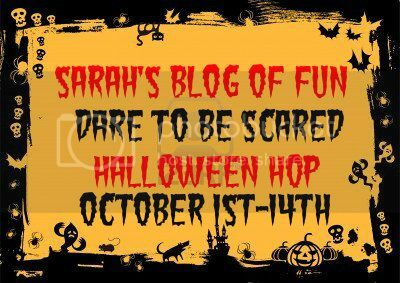 I ask that you visit all of the blogs participating in this hop. I am sure that all the prizes will be SPOOKTACULAR of course! Please enter the giveaway below. Welcome to the SPOOKtacular Giveaway Hop hosted by The Review Wire! With Halloween being only a few shorts weeks away, we decided that a Hop to help you get ready was in order! This event will run from October 1 through October 15, that gives you enough time to hop on down the list and enter all the SPOOKtacular Giveaways for your GHOULS and GOBLINS! Each blogger is giving away prizes valued $25 or more. The Review Wire is hosting the GRAND PRIZE, a $100 Gift Certificate to Halloween Express! Thanks for playing along and Happy Halloween! I was given the book The Trouble With Cowboys by Denise Hunter for the purpose of a book review. Who doesn't love a cowboy? Annie Wilkerson is a premier horse trainer in Moose Creek. She also is a columnist about horses for Montana Living. She is trying to put her younger sister through college so her money is very tight. She is also trying to take care of her young nephew. Then her column is cancelled and they offer her a chance to write for a lovelorn column. It is a new column and she is asked first. There is no choice, she needs the money. There is a problem she has to overcome, she has never been in love. Even though she is hesitant to make a deal with Dylan Taylor a ladies man in town, she decides to give it a try. If he helps her write the column she will take care of his sick horse. Annie comes to the conclusion that it is very hard to work with Dylan. For many years she has kept her heart safe by always believing that cowboys are always trouble. The closer they work Annie starts to think differently about him.She has to be strong so she will not get hurt. Annie continues to try to be in control of her life, but the more she tries the worse things get. Her sister is making her life out of her control with her behavior and she begins to have feelings that she cannot control. She wants to give her feelings to God , but this has not been an easy choice for her. Then Dylan tells her of his feelings for her. Annie is trying to try to decide if she should trust her head or her heart which she may hurt. Maybe this is the cowboy that she will find is a different kind. I was given this book by www.Booksneeze.com books . Yesterday, one of our lessons was a math lesson. Auntie Icky had printed out big numbers on sheets of paper. We know that Bobo and Sissy already know their numbers to plus 100 but we keep reinforcing adding and subtracting. Bobo and Sissy took each paper, which were numbered up to 20 and laid them out on the floor in order. Then Auntie Lala took a big container that they have full of animals and asked each one to take out the amount they wanted and then to place them on the right numbered page. After we had done all that we took them away in different amounts. They did fantastic!! We are starting to figure out our weekly menu for next week. One thing is certain Mommy has to make a big batch of homemade sauce and meatballs to freeze in different containers ready to defrost on a busy day. It saves so much time and they are so easy to pull out of the freezer in the morning for dinner. We love to do this especially on the nights that Sissy has dancing school. Just a side note, if anyone has a PRICE CHOPPERS GROCERY STORE near you tomorrow Saturday only they have turkey breast on sale for $.99 a pound. They average 6-9 pounds.That is a great buy. You only allowed to get 2 per person. They are great on weekends and for leftovers during the week. They also have potatoes on sale for $1.99 or 10 pounds, a great start to a great dinner for about $7.00. This is for a family of at least 4 with another night for leftovers. Now that colder weather is coming it is nice to cook comfort food and be cozy. In the next few days we will have our menu done. Some people do them by the month, we are not that ambitious. PARENT NOT UPSET HER CHILD GETS SPANKED IN SCHOOL SHE'S UPSET IT WAS DONE BY A MAN??? Wow! Now I am really ticked off! The news is reporting that a mother is not upset that her daughter was spanked in school, she's upset that it was done by a man. What the ... is wrong with her and parents like her? If a parent spanked their kid and they went to school with a red bottom the parent would be arrested!! No one better spank anyone else's child in front of me! Prisoners have better rights than our kids at school. Why is it that some are of the belief that teachers have the right to dole out corporal punishment? Get a grip parents. Take back your control. Do not ever apologize for caring about your child. Why is the wrong person apologizing. The school, those involved are not mad they did it, their upset they got caught. I can only hope that this is not a daily occurrence. We are exhausted! Sunday was Nana's parents 60th Wedding Anniversary. Yep, 60 years. We had relatives from all over, California, Maine, New York, Washington DC and more. Now we need to get back to work. The IPad is still by far the best thing we ever bought for the kids. I was watching the news last night and a school system nearby voted to give freshmen and sophomores IPads next year. It will cost over $200,000 just the first year. I also am very concerned with all of the reports about high stakes testing. Just one more reason not to send your child to school and to homeschool! I know I have said it before and I must sound like a broken record, no one can force you to allow your child to take a test, especially if the test is not handed over to the parents like they are now. The real issue is that the Constitution guarantees our right to direct our child's education. I am really concerned that so many are running around trying to explain to parents how to opt out their child. There is no need for all of this. It is simple. Just say no! If they want it in writing just write I do not want my child to take this test. If they have already taken the test and the school refuses to hand it over then again write a letter citing the law and demand it, in a nice way. If that doesn't work go as high up as you have to. When I fought and won in 1999 I went all the way to the United States Department of Education. It took awile but I won. If I had my way standardized testing would be outlawed. We are continuing to work on basic math. I cannot wait to use the table we made , shown in an earlier post that was a dressmakers board that has inches already on the board. It is so rewarding to see them learn and see how much they want to learn. Once again our family is happy we made the choice to homeschool. Last Sunday Mommy, Daddy, Auntie Lala , Uncle Lala went with Bobo and Sissy apple picking. What a difference a year makes. They were taller and more interested. They picked a ton of apples. Mommy made lazy apple pie, and baked some apples for dessert. Daddy couldn't stop eating the hot apples! Auntie Lala can't stop eating them just like they are. We talked about the seeds and how a tree grows. Auntie Lala told the story of Johnny Appleseed which I think is a little different version than I knew. We also got a few sugar pumpkins which we are going to paint, then use some for pumpkin pie. The kids will be able to carve them right before Halloween. When Mommy and her sisters and brother were small I remember buying sugar pumpkins that lasted right up to Christmas and I was able to make an pumpkin pie. We started collecting different leaves that have fallen off of our trees. We will then do a project trying to identify the different trees that they came from. We have been trying to be frugal this year. This the first time that we have our own corn husks to decorate with this year, Usually we buy a bunch. When the weather gets like this I always want to start baking and love the cool nights. Hey, I just thought of another reason we like homeschooling, we won't have to go out in the bad weather or wait for the schools to be closed for the day due to snow. My kids and other people that know mew are probably laughing right now. I was known as the mother who did not send her kids to school in the morning if it had already started snowing and it called for more. Not after the time I did believe the weather man and I had a frightening half an hour trying to get my precious babies home. After that we just watched on TV and hoped that others got home okay. The kids are really doing well on the homeschooling. Whenever we go our we let them pay so that they will start to learn the diferent coins and what they are worth. I have begun to participate in a weekly group called THE CARNIVAL OF HOMESCHOOLING.It is a source of information, inspiration and encouragement, which is a weekly blog and each week a different blog hosts it. This week our post Playing While Learning.......Teaching Our Country' History, Something Our Public School Do Not Do Enough Of is one of posts this week. The link to this 350th Carnival of Homeschooling is http://www.Janice-Campbell.com/2012/09/18/the-350th-carnival-of-homeschooling-ideas-you-can-use . We have been lucky to be encouraged almost everyday to keep up with our homeschooling. Anyone who feels like they are the only ones doing this need to know that they are not alone. Our numbers are growing every single day. It is very interesting to read and to gain new thoughts and ideas. Our blog started out as a blog which would talk about saving money, and about our family mostly Bobo and Sissy. The funny thing is that our blog has turned into so much more. This blog has also become our family's journey with homeschooling. Maybe we started this blog for a reason that we had no idea of at the time. Some people say that here is a reason for everything. I am getting used to reading like I used to. My husband used to tell anyone and everyone who would listen that I did not read a book I devoured it! I would be so engrossed that I could not put it down until I finished. I was given a chance by BETHANY HOUSE PUBLISHERS to review Whispers in the wind by Lauraine Snelling. Everything she writes is wonderful. This is Book 2 in the Wild West Wind series. Cassie Lockwood and her friends have left their former Wild West Show and she, after looking for awhile finally finds the land her father had left her. But, when she arrives she learns that someone has built a ranch on her land. When she arrives Mavis Engstrom is totally caught by surprise. She is forced to tell secrets that she thought had been hidden for years.Ransom, one of Mavis's sons believe that she is not have a claim the land. Her younger son Lucas has fallen in love with her immediately. Cassie wants to fulfill her father's dream. He had wanted to raise horses on his land. Cassie wsas afraid that she would have to return to her former life. She has to put her trust in God to show her the way. This is a wonderful book to read. How does the saying go? You never really know what is in your own backyard. This afternoon we went to a beautiful well known park a few miles away from our house. We could not believe what they had there. There was a big playground with swings, slides, merry go rounds and monkey bars. The kids had a ball. Then there is a beautiful garden called a serenity garden which I loved. They also had a concession stand and the prices were not at all unreasonable. Bobo and Sissy had fun with the other kids who were all happy to be there, too! We have been and still are looking around for different places to go to be around other children and to learn something at the same time. There was also a Nature Center which had stuffed animals such as a bear, a wolf, a bobcat and a possum to name a few. Then there was a button to push that tells all about that animal. Even in the garden there were buttons that told of the story of the plants that were grown there. There were live animals too, ducks, huge swans. roosters, geese, chickens, an owl and a peacock. We were able to get three components in this afternoon, teaching, learning, and socializing and above all we had fun doing this! One of the most important things that I hope I pass on to my grandchildren is my and my late husband's (their Poppie's) love of US History ! We both loved reading about the early days of our Country being founded. We loved to read about the principles that our Country was founded on and what our early leaders endured so we would be strong today. We as a family do not think that our public schools are teaching enough of this subject today, something they did when we were attending school. I am not sure if they even talk about the Declaration of Independence or our Bill of Rights, something we used to have to recite. We had to read and learn poems like Old Ironsides. We will be taking a trip soon to Sturbridge Village and will be seeing some of this kind of living in those days. That is one reason why our family has embraced Homeschooling, we decide what we believe is really important to know, not someone else. I was able to read a copy of A Season for Tending by Cindy Woodsmall. I love all of her beautiful stories. She writes about people that you start believing really live and you get engrossed in her stories. This story which is Part One of the Amish Vines and Orchard Series.Rhoda Byler is part of the Old Order Amish. Many of the people think that she is weird because she has unbelievable abilities to grow herbs and berries in her beloved garden. She decides to stay by herself because people start to spread rumors that her ability is causing a problem in the community.She runs a canning business which is doing well. Samuel King lives miles away in Harvest Mills. He is struggling to make money running his families apple orchard.He is the eldest son and his brothers help him.His younger sister Leah is not happy and after a night of partying she wakes up in Rhoda's garden.Her choices bring Rhoda and the King family together.A tragic mistake in the orchard leaves Samuel without any solution. Rhoda may be able to help but she is afraid to leave her garden.What will Rhoda bring to this family? Would it bring two families together that desperately need help ? If you would like to read about the author and more of her books please do so at http://www.cindywoodsmall.com. You can also read all about the author at http://waterbrookmultnomah.com/author-spotlight?authorid=72213 . You can also find this book on http://waterbrookmultnomah.com/catalog.php?work=208962. I was given this book to read by BLOGGING FOR BOOKS REVIEW by Waterbrook Multnomah Publishers and my opinions are all my own. LAST CHANCE TO ENTER ! We are into the last 71/2 hours of our Fall into Homemade Giveaway Hop!! There are a great bunch of bloggers with great prizes. Don't forget to enter. Todays's question is one that I could write a book about and still have more to tell. The question is What do you think of the current education system? I could answer a lot of ways but the one that best describes how I feel is disgusted and scared for our children. I have written before about how happy I am about my grandchildren being homeschooled. I have written about how I can sleep better at night knowing that they are safe! Safe from bullying, violence, and more. I served 4 years on our local board of education, a position I was elected to by our town residents. I was entrusted with helping to make sure their children were safe. I felt as if they were all my children and I felt as if I was fighting a new war everyday. The federal government telling the state what to, the state in turn telling the towns and cities what to do, all without providing the funding to make this all a reality. I have seen how the children are not being given the one on one they need because the class size is to much for one teacher. I have seen how teachers are being forced to teach to a standardized test in many states and parents are only now, in the past few years understanding that this is against the children's rights and their parental rights. I realized this in 1994 when my daughter http://dealsharingaunt.blogspot.com was given a standardized test that I had to fight for 5 years to see. It took the United States Department of Education 5 years to find in my favor. There is no place for standardized testing in our schools ! There is no place for testing our children in secret which this is exactly what it is when we are not being allowed to see our children's tests! The parents must come together and say this is enough and take back their rights. Until this happens our education system will fail our children , one child at a time! I am tired of reading what some of our children go through everyday at some of their schools. BUTTER AT BIG Y FOR $.98 !!!! Big Y has their own brand of butter this week for $1.98. There is a coupon on their website for $1.00 off one. That means butter will be $.98 for 1 pound !!!! You are able to print out 5 and you need a silver coin for each or the silver card. Great time to stock up and freeze. They did this awhile ago and I need to stock up again. The question for Day 12 is How was your class reunion? When it came time for my 5th class reunion my husband and I were able to attend both his and mine. We both graduated the same year, two towns next to each other. It was nothing spectacular, the same kids saying the same things, just a little older. They were in fact to old to keep acting like they were still in high school. My husband's was a better reunion. I knew a lot of the people he graduated with and we had a great time! When it came time for our 10th reunions they were both on the same day ! Just like when we were in high school and our senior parties were on the same day. We decided to go my husband's reunion. It was because we had decided to buy a house in my husband's hometown and I was involved in politics we decided to attend his. We got to have a great time. What was your least favorite subject ? I have 2 that are in a close tie. I hated Math and Chemistry , which I guess are kind of tied into together. I tried to avoid these as much as possible. SCARED FOR SCHOOLS & DOLLAR TREE ! So now we have other reasons to home school our children. Now we are hearing on TV that dentists are going into schools, holding kids down and performing dental procedures on children without parental consent. The really scary thing in all of this is that in the comments some parents say that they see nothing wrong with this action! Some of the teachers think that this is okay! We as parents need to stick together and stop this! I would encourage anyone who has children in school to be very vigilant. I am so very afraid for our children. On another note I really cannot begin to tell you how much the DOLLAR TREE store close to our house stocks school supplies. They have maps, flash cards, forms for children to learn to write their letters and more. They have a lot of items for craft projects. Every time we go there we end up finding tons of things. The ipad is still a big hit and we have to have sharing time limits to be able to use it. Maybe someday when the prices come down we will be able to get two. We will begin working on learning to tell time. We are working on sight words and blending sounds together to form words. Everyday is a new wonderful experience, and that is what school should be about !! Day 9 question, Who was your favorite teacher? That's really a hard question. I find myself going back to when I was in high school. There was more than one teacher who found it easy to tell me that I had a future in something that needed a person who liked to talk and always had an opinion. A few also said that I could think fast and had a good memory. When I had children, I did not like the way that the schools were allowing things to happen so, my answer then as a concerned mother was to get involved in the PTA and eventually I was elected the Chair. A few months later because I was not afraid to speak up I was asked to run for political office. I never really thought about it, but with my family's support and the words of my teachers in my ears I decided to try it. I was hooked ! I ended up serving 2 years on our local Town Council and 4 years on our Board of Education. I learned on the way that I was lucky to have teachers that encouraged my ideas and dreams I never knew I had. Now, I find myself disillusioned once again with our public schools and I am very happy that my daughter is homeschooling my grandchildren . A great teacher is one who finds a child's strengths and focuses on them. As a family which is new to Homeschooling we are very thankful to all of the homeschoolers who have offered their help, their ideas, and most of all their support. We, of course I am sure like many others, have been met with disbelief and more. There are those who try to make us feel guilty and make us feel that we really do not know what is best for our children. We have learned, through the help of others to ignore these comments and criticism.We all know that our work is not done. It is important that we keep up with what we are doing and help get the word out to as many people as we can. We are very lucky to have ways to communicate that people before us never had, and we should use them as much as we can. Maybe if enough parents understand that they have the right to direct their children's education, we will no longer be the smaller group but we will in fact be the larger group. As the educators tell us, knowledge is power then we should be strong and show our strength, our knowledge and our reasons why we believe homeschooling is the best choice. The most important thing is our children and we must stand up for them. All of us should be willing to spread the word in as many ways as possible. Mommy has decided what our daily schedule will be. Thank goodness we can relax and get back into our daily tasks. The new stove was delivered yesterday and we are well rid of our 1 bat situation. Every item in the house has been washed and or wiped with clorox wipes. The most wonderful thing about this is that it can be modified or changed at anytime. We are free to follow the lead of Bobo and Sissy. The more I hear about public schools the sicker I feel. There are educators out there who believe that the results of a standardized test is the ultimate reason for schooling. They believe in teaching to the tests and really think that this is a true measure of knowledge. I believe that parents who have to send their children to school should refuse to let their state and or federal government test their children.Just because you are not able to homeschool your children does not mean that you allow them to direct your child's education. There are many reasons why parents decide to homeschool their children, first and foremost because we believe that we can do better than the schools, and I believe that we can and should. We should also feel free to voice our opinions. I guess this was my favorite when my children were young. I always looked for economic ways to fed 4 children and myself and Daddy. I used to take about a half cup of chopped onions and saute them in oil, sometimes vegetable or olive oil.............then I would take about 4 or 5 hot dogs and cut them up into small pieces. After they were a little browned I added a large can of beans. I heated it all up and served it with warm rolls or bread and butter. It could be made to serve more by adding more beans. It was a nice warm meal to have in the fall or winter and it was really fast. My kids loved it!! It also was very low costing. We were so excited to have a Hope Springs House Party by House Party ! We are ll in love with Meryl Streep! The gift bags and the drink glasses were beautiful. Can't wait to see the movie !! MY LATE START TO THE AUTUMN BLOG CHALLENGE ! I am very sorry that I am so late getting up to speed but there were circumstances beyond my control (a bat in one of our houses.) Mommy's little sister http://dealsharingaunt.blogspot.com has reminded me to get with it. Day 1 the question was Why have you decided to participate in the Autumn Blog Challenge ? Because I love to hear from other bloggers what their ideas are and to share mine. OUR NEON TIKI TRIBE MOMMYPARTY WAS A HUGE SUCCESS ! Here is our kit before the party ! Here is Sissy showing off her t-shirt! Even the grown ups loved the glasses and we are ready to do battle. Oh my gosh where do I start When we were offered a chance to have a NEON TIKI TRIBE PARTY by MOMMYPARTIES we jumped at the chance. We are always looking for new and fun books to read as our children are being homeschooled. It gave us a chance to get children together, learn lessons and have fun all at the same time. All of the children put on their sunglasses and picked a hero they wanted to be. Tia, Zeke, Mowah or Dar were hard choices to pick from. The stories were wonderful! The books were very easy to read and understand. The dyslexie font in all of the books is designed to help the 1 in 10 children who display dyslexic symptoms by using this font to show the way. We also were provided a T-shirt to keep and we gave one away at the party. A huge thank you to providing the items for the party. All opinions are our own . I am so very thankful that Mommy is homeschooling. I drove by a school today and saw the kids already looking looking like they just do not want to be there. It was all not because they are just kids, it seemed as if some were scared and acted very shy while others kind of acted like they were really popular and bossy, how do the average kids fit in? Because we had a problem this past week with a stove breaking and a bat in the house the kids and Mommy stayed at Nana's house. In a few short weeks Bobo has practically mastered the ipad and Sissy loves the computer. Because I am a former Board of Education member in my town I am well aware of the costs to educate each child and how hard it is, if not impossible to get all the equipment they really need. The ipad is one of the best things we have ever bought. Today the kids found 2 large magnets that Poppie had and went around the house finding out which things would stick to the magnet. They had a ball and then we compared each item, why they stuck together and what they all had in common. Right now the kids seem to be learning something new each day, but the really funny thing is that they are actually interested and want to learn. The counting each item, the minor addition and subtraction are really taking off. Also because of the elections we are talking a little about the President and who will be running against him. We have not really settled into a routine yet but after this commotion we hope to do just that. What was really weird was that when Mommy's oven broke we sat down and listed all of the other ways we could cook. We have a microwave, a griddle, a grill for steaks or hamburgers, a crockpot, a toaster, and more. It was amazing to see how many gadgets we really have, So we were able to make full meals in the crockpot or microwave, the griddle could make pancakes, eggs, grilled cheese, and more, The possibilities are endless. It was also plain to see that the weather was getting colder because Mommy went on a baking binge. She loves to bake, just not as much in the hot summer. The great thing is, we get to eat all of the good stuff. So, where do I start? Last week Mommy and Daddy had a bat fly around the house so Mommy immediately put Bobo and Sissy in the car and drove over to Nana's house. On the advice of their pediatrician they both had to get the rabies vaccine which is 6 shots total. Mommy and Daddy each got 9 altogether. They are given as a group and then one each every few days. I had to also get 9 shots the next day because I was exposed. Mommy's sister www.dealsharingaunt.blogspot.com and Uncle M. also had to get the shots because they tried to help Daddy catch it. The police came 2 times that night and could not find it. We called a professional in the next day and after hours of searching could not find it. Daddy had to sit up for 3 nights and see if he saw it flying around, but it never did. On Monday we had all of the rugs shampooed and we cleaned every and all the kids rooms top to bottom. Auntie Lala and Uncle Lala were helping us because we really thought that it was finally gone.When Uncle Lala moved a shelf in the corner, guess what , he found the dead bat. Now naturally being a holiday no one wanted to help us so we took it to the vet to see what they could do. Then Auntie and Uncle Lala had to go to the Hospital to get their shots. Now we have to shampoo the rug all over again. First a broken stove and a bat all in one week. We are all exhausted and we all need a vacation. It really is no secret, I really love to read. I was able to receive When Hope Blossoms by Kim Vogel Sawyer for a review. This is one of the most heartwarmimg books I have ever had the pleasure of reading. A mother of three, Amy Knackstedt has lost her husband and hopes that a new start in another town will help with the sorrow because of losing her husband. When she arrives she meet Tim Roper, a neighbor, who is not happy with her family moving in next to him. Amy's family are an Old Order Family. you see, Tim has left this family long ago and does not want to be reminded of those days. Beyond their control they are brought together and eventually form a friendship. They both are have been hurt before and they will need to trust each other in order for them to have a future. I loved the way the author deals with love, friendship and growing together. It is a beautiful story as is all the authors other books.I was provided a copy of this book to review by Bethany House Publishers with no other compensation and all opinions are my own.